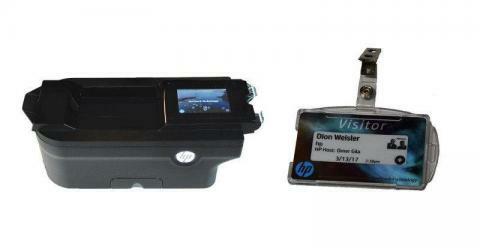 HP Developed a new system, called IonTouch, which enables cheap and easy "paperless" printing. The basic idea is that IonTouch can be used to "print" small displays for applications such as calling cards, QR Codes, badges and more. Those cards are based on E Ink, and so does not require any power while the image stays - and of course the image can be changed with the "printing" equipment. Each display is a 2.5" 300x300 monochrome (16 grayscales) E Ink panel. HP is aiming for a low-cost solution and each display will cost less than $2 to make. Bledology E Ink badge is an interactive contact exchange platform aimed for conference attendees. The badges use 4" E Ink displays produced by Plastic Logic. The E Ink badges are now available and cost $60 each (these are reusable of course across many conferences). The Study Watch by Verily Life Sciences (ex Google-X division) is a health-tracking smartwatch that features an always-on E Ink display, environmental and physiological sensors and long-lasting battery. 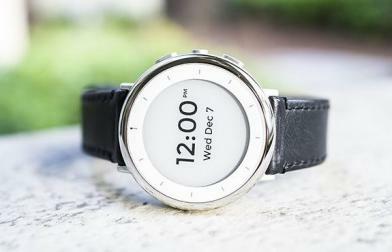 The study watch will used in observational health studies - it will not be sold to consumers. The Onyx Boox Typewriter is a laptop device that uses a 9.7" E Ink display. This is an interesting design that may appeal to writers and many others if it is executed correctly. The Onyx Boox Typewriter is not official yet, but this interesting device was spotted in an official company brochure. E Ink and Sony Semiconductor Solutions announced a joint venture with an aim to develop, manufacture and market products that use e-paper displays. Sony and E Ink Holdings will have about 70% of the shares in the new JV, while the rest will be owned by venture capital companies. Sony has been using E Ink displays since 2004, first with its e-reader devices (it is still offering its large 13.3" flexible E Ink based reader, but the smaller ones are no longer in production) and later with wearables and other unique products.